Antivirus software might be the reason why you cannot install the program successfully, such as drivers, video program and some other important applications. They might not recognize the software. So when you cannot install the software, you can try disabling the antivirus software temporarily. 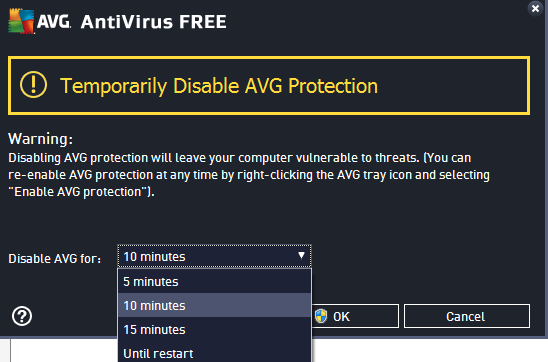 AVG is one of popular antivirus software. If you are using AVG Free Edition 2015, you can follow these steps to stop it temporarily. Click the small triangle on your Windows taskbar to open the notification area. Right-click the AVG icon for a list of options related to the security suite. 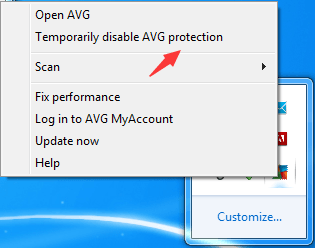 Click "Temporarily disable AVG protection". You can specify the amount of time you want to disable the program. Then click OK button.